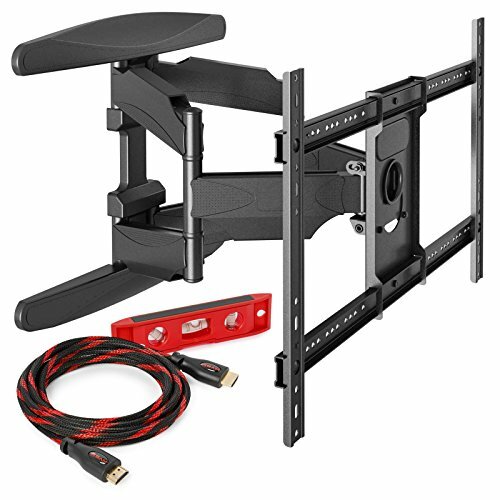 This premium articulating mount is designed to universally fit most LED, LCD, Plasma TVs and other flat panel displays from 42" to 70". This unit is designed to use the standard VESA patterns installed in almost all flat screen TVs with a range of 200mm x 200mm up to 400mm x 600mm. Constructed from commercial-grade, heavy-duty steel, and high-quality barrel hinges, this sturdy unit is rated with a capacity up to 100 pounds. The smooth-motion, articulating design allows for tilting, panning, and extension to find the perfect viewing angle. The arms of the television mount can be extended up to 20 inches from the wall or retracted back to within about 3 inches. In addition, the TV can rotate up to 160 degrees left or right and the tilt can be set from +8 to -5 degrees to find your ideal settings. Convenient openings in the arms and back plate provide space to pass cables and wires through for a clean and uncluttered look. For your convenience, the articulating arms and back plate are pre-assembled right out of the box and the step by step instructions will guide you through the simple assembly and installation process. Certifications: RoHS, CE & ISO-9001. Also included is a 6 inch magnetic level to help you get the perfect installation. As an added bonus, we have included a 10' HDMI braided nylon cable with gold plated connectors. Universal fit and compatibility for televisions from 42 - 70 in.